Adapt9S12C is a next-generation version of the immensely popular Adapt11 product originally introduced by Technological Arts almost 20 years ago. The flexible design, wide range of connector options, and breadboard pluggability address all aspects of training, evaluation, development, prototyping-- and even volume production. If you are migrating from the 68HC11, you'll appreciate the backward-compatibility. At the same time, you'll love the powerful HCS12 instruction superset, with its advanced DSP-like instructions, 16-bit arithmetic, memory-to-memory moves, and many powerful addressing modes. supports programming in C, BASIC, Forth, assembler, etc. 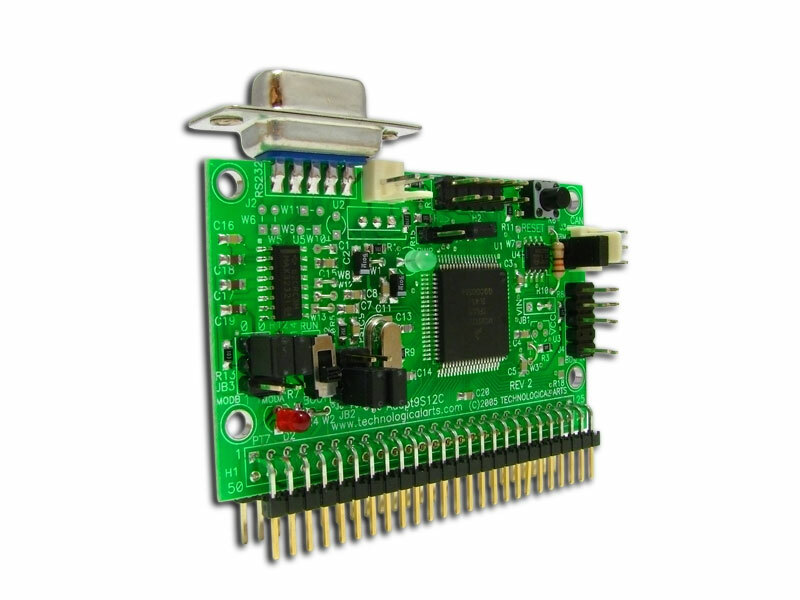 With a 2K Flash-resident debug/monitor program, you'll be able to load your program into the remaining 126K Flash via the serial port using the CodeWarrior or uBug12JE. The entire 126K Flash can be programmed in about 12 seconds! To use the monitor for debugging or code-loading, just set the switch to LOAD. To run your standalone program thereafter, leave the switch in the RUN position. Your code runs from Flash, and interrupts are supported (via Flash-based pseudo vectors, since the monitor resides in the vector space of the MCU). A program you load into Flash this way will run every time you apply power or reset the board in Run Mode. If you use a more advanced development tool (such as our USBDMLT or UBDM12LX5 pod), the entire 128K Flash can be used, because the Flash-resident bootloader is no longer needed (therefore pseudo-vectors aren't required either). Special Edition of CodeWarrior C compiler from Freescale. It has a 32K C code limit, and unlimited assembler!